Concrete doesn't really need ongoing maintenance. But occasionally it needs repair, particularly after years of hard use or weather exposure. Fortunately, now the average handy homeowner can handle those fixes himself, saving the cost of a contractor, thanks to advanced concrete repair products. Here's how it all works. Other than wood, concrete may be the most favored residential building material in the country, because builders and homeowners recognize two of its chief virtues: undeniable durability and almost boundless versatility. Since it’s used in everything from foundations to patios, chances are good that, somewhere in your home or on your property, there’s at least one concrete surface. You may not pay much attention to it—after all, concrete needs very little maintenance—but for all of its hard-wearing strength and damage-resistance, concrete isn’t indestructible. Over time, particularly with exposure to the elements, it can become vulnerable to one of a few common issues. Most are merely cosmetic (light flaking, for instance), while others are structural. In either case, thanks to manufacturing advances from category leaders such as CTS Cement | Rapid Set, complications in concrete are now fairly easy to remedy. You don’t need any special skills or previous experience; the only prerequisites are the right materials and a bit of know-how. So, regardless of whether it’s your concrete driveway, garden path, or basement staircase that’s in need of a new look, you can complete the overhaul yourself, without having to pay a contractor. Superficial concrete issues include weathering, wear (from vehicle and foot traffic), flaking and staining. Another culprit: “craze” cracking, wherein shallow, spiderweb-like cracks appear all over. If one or a combination of these factors are ruining the outward appearance of your concrete, take heart—there’s a simple fix. 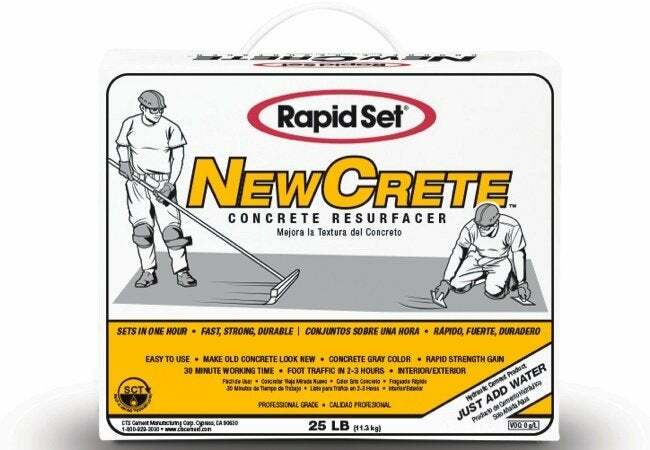 By using a concrete resurfacer like Rapid Set NewCrete Concrete Resurfacer, you can eliminate all of those eyesores in one fell swoop, leaving your concrete transformed. A high-performance resurfacer, NewCrete simply goes over the existing, imperfect concrete surface and gives the installation a smooth, attractive, like-new appearance. Suitable for indoor and outdoor use, the cutting-edge product self-cures, which means that, once you apply it, there are no special additional steps to remember. After only two or three hours, weather depending, you can expect the new layer to be ready for foot traffic again. Rapid Set NewCrete Concrete Resurfacer is very easy to work with. If you want to use the product to restore a pristine look to any lackluster section of concrete, begin by throughly cleaning. Next, prepare the NewCrete, combining the mix with water in the recommended ratio. Work the material for two or three minutes until it reaches a uniform, lump-free, pancake batter-like consistency. Next, lightly dampen the old concrete and use the NewCrete to pre-fill any minor cracks or holes. Then spread the NewCrete in an even, thin layer up to an eighth of an inch thick. 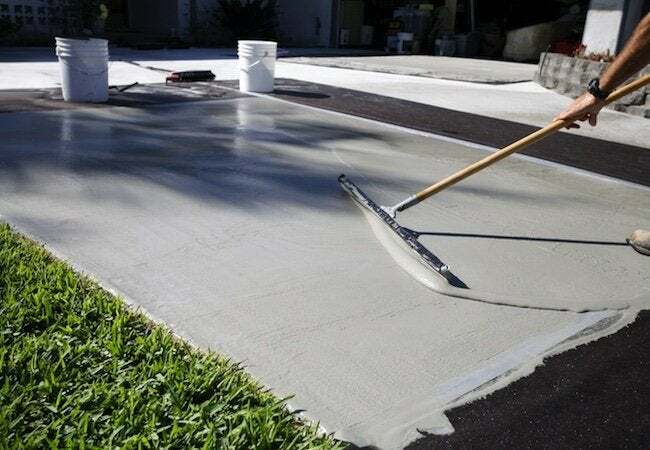 NewCrete, like other resurfacers, remains spreadable for about 30 minutes, so if you’re resurfacing a large expanse, such as a driveway, it may be wise to do one section at a time. Once you have finished the application, it’s just 60 or 90 minutes for the job to be considered cured and complete. More extensive damage calls for a more extensive repair. Crumbling, chipping, or deeply cracked concrete can result from poor installation or various environmental factors (freezing and thawing, for one). No matter their precise cause, such non-superficial flaws can be speedily corrected with Rapid Set Cement All. Formulated for multiple purposes, Cement All works as well for new construction projects as it does for small repairs. It boasts a number of remarkable attributes. First, Cement All offers superior adhesion, not only to materials like brick and stucco, but also to pre-existing, damaged concrete. 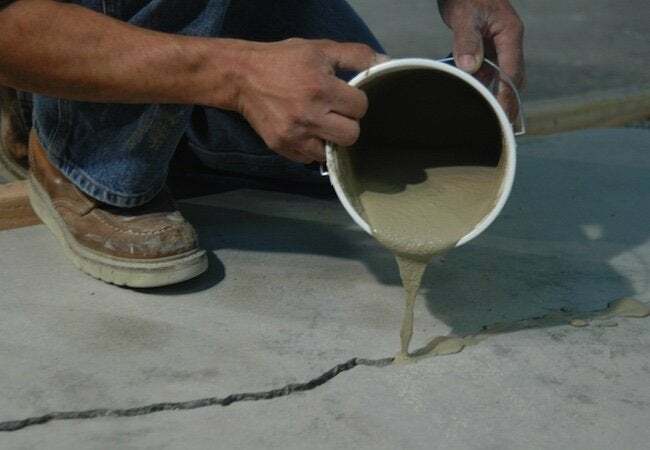 And whether your repair requires a skim coat or a four-inch-thick application, Cement All can be counted on for exceptional strength; it’s rated three times stronger than most concrete! Perhaps best of all, Cement All sets in 15 minutes and can be ready for foot traffic in an hour. To rescue cracked or crumbling concrete with Rapid Set Cement All, start off by properly prepping the old concrete. That includes removing the damaged portions of concrete as well as any dirt or contaminants (paint, for example, or oil) that would prevent bonding. Next, roughen and saturate the concrete surface, avoiding standing water. Now, you can get ready to mix the Cement All. For a full 55-pound bag, add three to five quarts of water to the mix. Work the material, ideally with a power-driven mechanical mixer, from one to three minutes. Finally, apply the Cement All to the repair area, packing it to the desired level. Note that for certain jobs, such as repairing concrete steps, you may need a form to help the concrete maintain a specific shape or profile. Smooth the concrete to a finish with your choice of a trowel, float, or broom. Once the surface loses it moist sheen, finish by water-curing for at least an hour. After restoring an older installation with Rapid Set Cement All, you can go a step further, if you choose, by unifying both the repaired and unaddressed areas under a new layer of Rapid Set NewCrete Concrete Resurfacer. Indeed, if the concrete can be salvaged at all, then you can use one or the other product, or both, in your efforts to revive it. Years ago, ripping out the concrete and starting again might have been your only option, but times have surely changed! 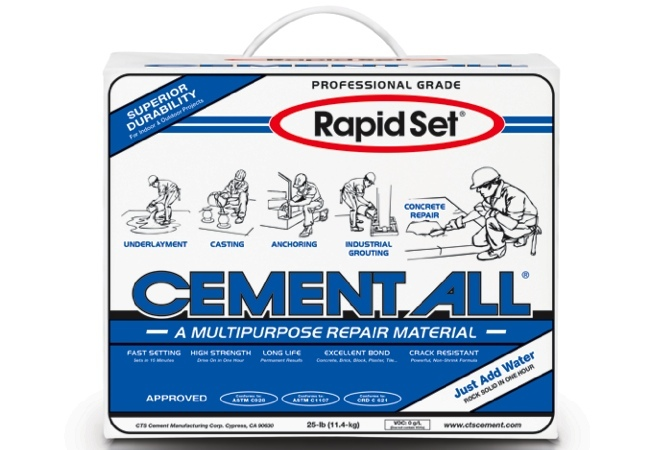 CTS | Rapid Set products are available at The Home Depot. This post has been brought to you by CTS Cement. Its facts and opinions are those of BobVila.com.